Preparation for Professional Cleaning Services: Is It Needed? Hiring a professional for a cleaning job is a common practice nowadays. People leave their homes in experienced cleaners’ hands because they find it easier or time-saving. Whatever the reason, there are lots of benefits of having your home cleaned by someone else, but you can help them achieve the best and meet your expectations with some things as well. This article is for your own benefit because you want to pay for the cleaning, not for anything less. And when you want the cleaning done properly, you should also give something apart from payment. If you want your home to be perfectly cleaned, then make sure clutter is out of the way, especially if you pay for an hourly based service. don’t be surprised if you had to pay extra, simply because you left a mess in the bathroom or your bedroom. Imagine you were the cleaner. Would you like to go to someone’s home and find out that the surfaces are all cluttered? You cannot simply start cleaning if the surfaces are full of magazines, floors are covered in clothes, sink is filled with dirty dishes, etc. Remove magazines, folders, mail, paper sheets and similar items off the surfaces. If you have a pile of mail on the coffee table and you want it cleaned, then you should take care of it. Remove the pile and make space for your cleaner/s to do their job. Instead of organising magazines, cleaners have far more important jobs to do. Although it is similar to clutter, scatter is more often referred to as items and objects, which are temporarily out of their rightful places. Pick up dirty clothes from floors and furniture. It saves lots of time for cleaning, when clothes are not in the way. If you have kids, make sure their toys are also out of the way. Picking them and putting them where they should be will take much more time than the end of tenancy cleaning procedure itself. Simply help your cleaner/s if you want to receive the same. If you leave the dishes to be cleaned by someone else, make sure to soak them. It is far easier to remove stubborn grease if the plates and kitchen ware are previously soaked in water and some detergent (optional). Although you can leave dishes for the cleaner/s, not all of them will wash them. After all, you want a clean sink and leaving dishes in it will hinder the process and you might end up with a dirty sink, filled with dirty dishes. It is a common practice of people, who let cleaners in their homes, to leave them notes with instructions. For the first time the cleaner comes to your home, you should have a simple checklist for them to follow. In the process of working together, it is possible for you to add an activity or something more to be cleaned. Even if your cleaner is brilliant and does their job flawlessly, they wouldn’t know you wanted the windows cleaned, for example, if you didn’t tell them to pay more attention to them. Also, if you have an extra task, you should write it down, even if it’s on a post-it note. The thing with notes is that you shouldn’t be rude or bossy, simply because the cleaner is doing you a favour, even though you’re paying for it. You should be polite and understanding instead. There is a big difference between “Water the plants” and “If you have some time, please, water the plants.” one simple word can do wonders. 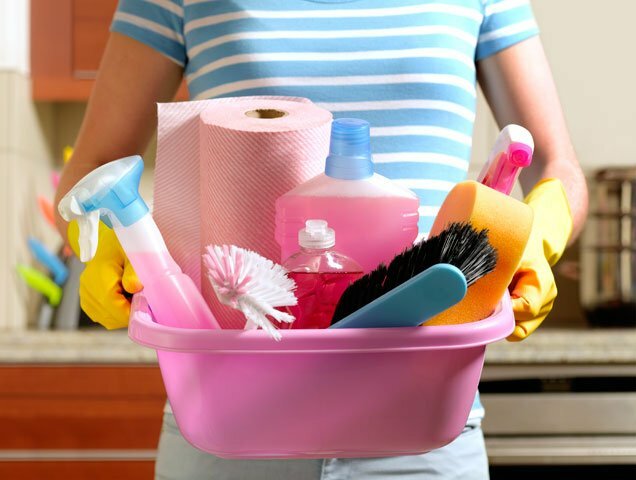 While you cannot give your absolute trust to the cleaner/s coming to clean your home, it is preferable if you are not there while they are cleaning. Your presence can simply distract them or make them work slower and more conscious when you are actually there. If, also, you are there, talking to them, might hinder the cleaning as well. It is sometimes even scary to leave a stranger in your home, so the first time you can be around, as long as you don’t give them directions all the time, or troubling them for minor things. Relax with a book in the garden, or have a cup of tea with a neighbour, while the cleaner does their job at your home. In case you work with an independent cleaner, they will most probably prefer if you choose the cleaning products. There are some people, who have favourite brands, others simply have allergies and thirds want green cleaning to be implemented, so it’s definitely better if you already have available cleaning products when the cleaner arrives. You should, also, not forget to ensure the tools for the job. Not getting a mop, for example, for the floor cleaning is not considerate of you, as the cleaner has to be on their knees while cleaning it. Unpleasant, right? If you are planning on moving out, you should notify your cleaner, especially if they are independent. They rely on you for a certain amount of their income and finding another customer is not always easy. Be kind to give them a few weeks notice, so they could find another job in the meantime. Although we’ve already advised you to be polite, it’s definitely worth it, to mention it again. Every person really does feel better when they are appreciated. Saying the words will not cost you anything, just like writing it down. Make sure your cleaner feels appreciated and not underestimated or simply used, if you want them to do their job willingly and flawlessly.